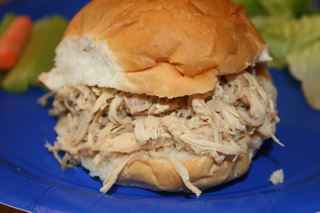 If you’ve ever been to the Minnesota State Fair and devoured a “Turkey To Go” sandwich you’ll truly appreciate this shredded turkey recipe. This is the closest recipe I’ve found to the real thing. Thanks to my co-worker Steve Milbrandt for sharing this at a work potluck and to his wife Sharon for writing this recipe down. This recipe keeps really well in the refrigerator for a quick sandwich in the microwave. You could even use this for Thanksgiving leftovers. Cook the turkey as you would traditionally cook a whole turkey. When the turkey is done, remove from the bag and let it cool. SAVE THE JUICES!! Pull turkey apart. Using your hands grab a chuck of turkey and pull pieces off. Put the meat in a crock pot. Pour all the juices over the meat. (The juices should cover half of the meat. If you do not have enough, use chicken bouillon or chicken broth). On low heat, cook the turkey for 5 to 6 hours. Turn off the crock pot and let it cool before putting in the refrigerator. Next day, season the turkey again following same amounts as before. Cook the turkey on low heat in a crock pot for about 3 to 4 hours. About 1-2 hours before you want to serve it, add more seasonings (if needed). NOTE: You don’t want the liquid to be runny, but you also don’t want it pasty. If it’s too thick, add some water. If it is to runny, add some more cornstarch mixture as follows: In a bowl, put in about 2-3 tablespoons of cornstarch and add just enough water to get the consistency of paint. Stir into turkey and check the consistency of the meat. Oh my gosh, these ARE about as close as you can get to the Turkey To Go sandwiches!!! I thought about these sandwiches all the way home from the fair this past Saturday and felt pretty smug when I read the recipe because I’d guessed pepper, Lawry’s, garlic powder and onion powder. We ate these the same day (because I didn’t read ahead!) and they were delicious!!! Can’t wait to see how they are after another day! My daughter loves these at the state fair. I said pffftt this is simps! I can so make this at home… then realized I had no idea how to go about it. I am sooo excited to try this recipe. I could not identify the spices other than garlic powder. This is great. Heading to store now! Thanks forever!! This is the best tasting Turkey recipe I’ve ever made or prolly tasted sooooo delicious….it doesn’t need any kind of condiment buy guacamole on the bun does taste awesome with it! How many sandwiches can you make from one whole turkey. I need to make turkey for about 100 sandwiches. I would make either 2 whole turkeys, or 6 turkey breasts if you decide to go that way. Sometimes you can find deals on the turkey breasts at the store. We typically serve smaller buns for large gatherings, not the large hamburger buns. People who are hungry will come back for seconds. Hope that helps! What size turkey or turkey breast….that matters too, right? Say I want to serve 50! How big should my turkey be and how much seasoned salt? Sorry for the delay, I was waiting to hear back from Steve, the author of this recipe. He suggested about a 25 pound turkey for 50 people. In regards to the seasoning, the recipe calls for two sessions of seasoning. After the first session, before refrigerating, sample the turkey to see how it tastes. That’ll give you a sense for how much seasoning to use on the turkey the next day. We’ve always gone on taste, but the next time we make it, we’ll try and remember to measure to give folks a better idea of the general measurements of the seasoning. Hope this helps!?! Hi I want to make this For Christmas but I’m Leary on the seasonings . I was reading the reviews and you said you were going to try to get exact measurements the next time you made it did you do that yet?? I have a ten pound turkey. Hello, we have not made this recipe and have not had a chance to get measurements. I think I would start with 2-tsp of Lawry’s, 2-tsp of pepper and 1-tsp of garlic salt. I mentioned in an earlier response, make sure to taste the turkey before you refrigerate. That will give you a sense of how much additional seasoning to add the next day. If you have time, measure and post back on the site. Good luck! Hi I did as you said in the measurements you emailed me and it was Purrfect!! I pinned it on Pinterest and will def make again. Yum!! Hi – I would love to try this for a graduation open house – but I would be serving about 150 people! Based upon previous comments – would I need to make about 3 to 4 20+ turkeys to do that? Can you make a head of time and freeze and if so, does it still taste the same after being frozen? I would like to try this for my son’s graduation party. I saw a comment about making this ahead of time and freezing it. Will that work? Thanks! Yes, freezing will definitely work. However, when you reheat your natural instinct will be to stir often. I recommend you stir slowly to prevent further breakdown of the shredded turkey. The more the turkey is handled the more it breaks into fine threads and it turns into more of a turkey mash versus the shredded strands you want. Hope that makes sense. When you put the seasonings on do you then mix them into the shredded turkey or just let them sit on top? Also, does anyone have measurements of the seasonings for a 15 pound turkey? Would it work to cook the turkey and then shred it and put it in the fridge, then season it the next day and put it in the crock pot for 5-6 hours and then refrigerate? Then the next day season it again and server? Or would 3 heat sessions be too much? Thank you! When seasoning we mix the ingredients in with the turkey, we do not let it sit on top. We don’t have precise measurements as it really varies, some people use more parts of the turkey than others. As starting point I would go with 2-tsp of Lawry’s, 2-tsp of pepper and 1-tsp of garlic salt. Make sure to taste the turkey before you refrigerate. That will give you a sense of how much additional seasoning to add the next day. Regarding your question about 3 heat sessions. It shouldn’t be a problem heating it three times, however, each time you heat the turkey it tends to break down and gets more shredded, sometimes almost too stringy. Since you’re heating three times, I might recommend shredding the turkey in larger chucks and don’t be too aggressive when stirring the turkey, that should give you nice shreds of turkey after the third session. Good luck! Curious if you plan to freeze could you novel cook, shred and do first round of seasoning then freeze then when ready to serve, thaw and do second round of seasoning? Or if those who did all steps then froze, how did it turn out? Do you season the turkey when you cook it the first time in the oven? Hi Jess, we do not do any seasoning the first time when we bake the turkey. However, it wouldn’t hurt if you did use some seasonings. We have made this recipe with leftover turkey from Thanksgiving which did have a some unique seasonings, the recipe still turns out great. So, either way you should be safe. I am going to make these for my husband’s retirement party. What would you serve as condiments? We typically server with different bottles of BBQ sauces and mustard, but to be honest, if you season it to your liking, plain is the best. Enjoy! I made this recipe for my son’s graduation party and it was a huge hit! I made 3 turkeys and by the time I had a chance to sit down to enjoy a sandwich, it was all gone. Everyone loved it! Thanks for the amazing and simple recipe!